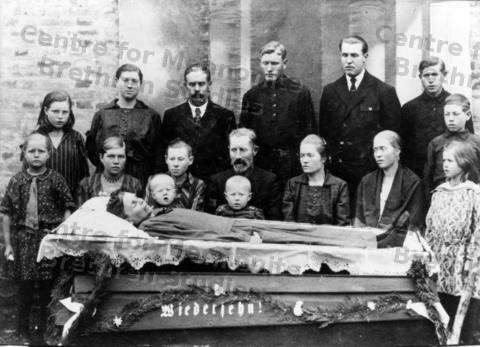 This is a photo of the Franz and Katharina Janzen (nee Katharina Boldt) extended family in 1928 around the coffin of Katharina, who gave birth to 12 children. It was common practice to have a family picture taken at the funeral with the open casket of the departed loved one. The funeral banner announces: Wiedersehn! (We will see you again!). Katharina and Franz with their seven younger children were the ones Jacob Funk went looking for and found in 1921.